Firefighters are due to return to a former hospital to investigate the cause of a major blaze at the site. 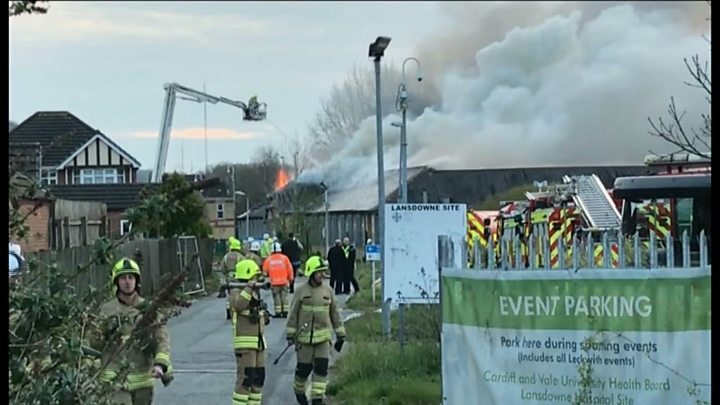 Crews from across South Wales were called to the Lansdowne site on Sanatorium Road in Leckwith, Cardiff on Sunday at about 19:00 BST. They left the scene at 00:01 on Monday and will return later to begin an investigation. At the height of the blaze, about 50 firefighters were at the scene, along with 10 appliances. No-one was injured. South Wales Fire and Rescue Service had advised residents on Twitter to stay indoors and close all windows and doors.